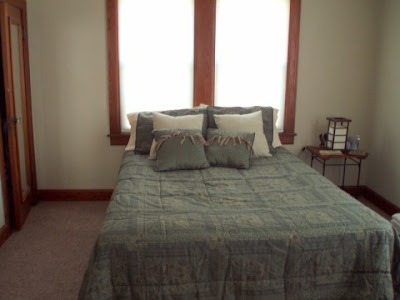 Today's before and after will feature our master bedroom. I feel like a lot of people wait to tackle the master bedroom last because "less people will see it." This may be true, but they are forgetting one fact...that the most important people will see it EVERY day! The master bedroom is your room. It should be your solace and your resting place. Even if nothing else in your house looks great, your master should. It should not be the eyesore that you wake to every day. I say tackle this room first because you'll get the most use out of it. And it will inspire you to keep the ball moving in decorating the rest of your house that the guests will definitely see. With that being said, let me show you our master bedroom. 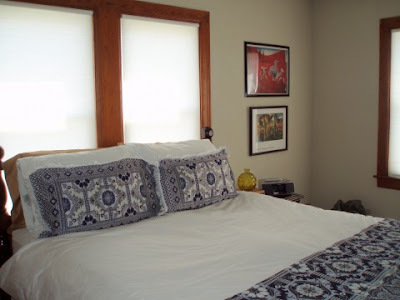 Initially Jon had his master bedroom in what is now our guest room. It was the smaller of the two bedrooms but had the only cable hookup. When I moved in, we switched things up and moved the master into the former guest room and decided that more space and a better layout was well worth sacrificing a TV. 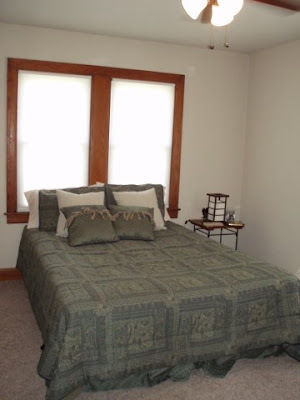 This was the previous master bedroom with all of Jon's belongings. Before: This was the previous guest room. With a short bed that was hard as a rock, and furniture that was too short for the space. After: This is the new master bedroom. Soft, warm and inviting. We literally got rid of everything in the room and replaced it will my old bedroom furniture from Dallas. It fit in the space perfectly. We also purchased new curtain rods and panels in one of my favorite fabrics, dupioni silk. This was especially important since one of the windows basically acts as our headboard. We put Jon's mattresses from the original master on my bed rails and now we have a tall bed that makes such a statement. I love tall beds. We also added a settee at the end of the bed that I got for a steal (down from $750 to $175) when I went shopping for our couch. It was a must buy and a nice way to add a seating area to a small space. The artwork was previously in my old living room and the R was used in the decorations for our wedding. The lamp and side table were from my previous bedroom and the glass bowl vase I found at a thrift store for less than $3. If you're lying on our bed, you see the dresser which served as my TV stand in my old living room. Everything on it was previously owned. Another view of that side of the room. View from the bed out to the hallway. We have a mini collage of four pieces of artwork I've collected over the years filling up what once was a big blank wall. Before: Drab, dull and disproportionate. Ostriches, Zigzags and Stripes Oh My!